Two of the most successful intelligence disinformation campaigns that survive today were put forth by British Intelligence and the Russian KGB during, and shortly after, World War II. During World War II, the British made a spectacular technological advancement in the form of early radar that allowed them to target German bombers flying toward England, particularly at night, when they were extraordinarily difficult to intercept. The radar was fabulously successful, and many new British fighter aces were baptized by fire through shooting down German bombers. Naturally, they wanted to hide this fact for as long as possible, so we can imagine the long meetings that took place to come up with a plan. One of the golden rules of disinformation is that the best lies are based on truth, a tenet often still used today. In this case, they chose to lie using real information and settled on the fact that carrots are high in Vitamin A, which is a vitamin useful to eyesight. This was the true fact that was then stretched to substantiate the lie that British pilots had extraordinarily good night vision that allowed them to intercept and shoot down so many German bombers at night. A substantial propaganda campaign was undertaken to convince the British public of the truth of the false statement, in order to have German spies pick up the information and pass it back to the German military. No clear records are known that indicate if the disinformation campaign had any effect on the Germans, but it was so successful with the public that it benignly lives on to this day. The USSR’s KGB of days gone by had just as great, if not a greater, success, albeit less benign. Following World War II, when the atrocities of the Nazi regime came to light, it surfaced just how similar the governments of the National Socialist German Workers’ Party and the Union of Soviet Socialist Republics (USSR) were to each other. This was both a problem for the USSR, which had just occupied much of Eastern Europe, but also distasteful, since the Nazi and USSR leftist dictatorships had been implacable enemies. As part of the early Cold War efforts, the CIA jumped into the fray and mounted a large information campaign, pointing out the truth of the similarities. Jews who had survived the Holocaust under the Nazis or Jews who had survived the purges of the USSR’s Joseph Stalin were integral to the information campaign. Note that this is correctly classified as a clandestine information campaign and not a propaganda campaign, since the information was in fact true. This effort was destroyed by The New York Times, who made public the CIA backing. The source of the information was almost certainly the USSR, who may have leaked the information to The New York Times or passed it through some other means. At the same time, the Soviet Union put a propaganda countermeasures campaign in place, painting the Nazi regime as a fascist “conservative” movement and, therefore, not a socialist movement at all. This not only survives as a widespread false concept today, but also, because of its success as propaganda, it has been built upon using a variation on the central theme. A quote often attributed to UK wartime Prime Minister Winston Churchill (though probably not said by him) is: “The fascists of the future will be called anti-fascists.” This has come to fruition, as a number of today’s socialist movements have adopted many of the early Nazi tactics used in their rise to power. One need look no further than today’s Antifa (Anti-Fascist) organizations for a perfect example. Just like the “brown shirts” used by Hitler to help him rise to power, they march in the streets, wear a uniform (black hoods), attempt to stifle other opinions, use physical intimidation, and openly espouse the use of violence for political action. These were precisely the type of activities used by the Nazi brown shirts to help Hitler rise to power. These extreme tactics and violence are both tacitly and openly supported by the left in the United States. 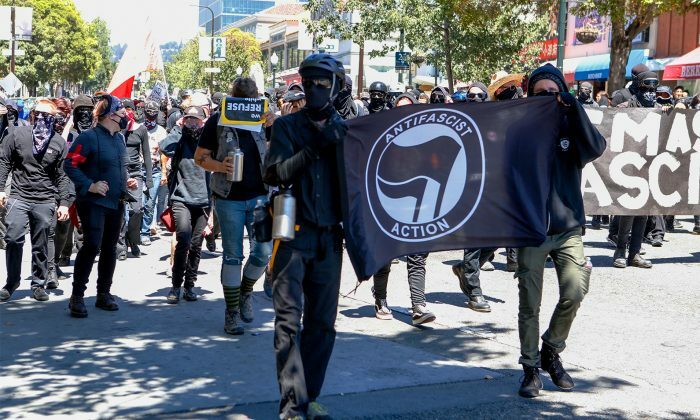 This past October, Antifa held large demonstrations in the famously left-wing Portland, Oregon, where they were filmed verbally attacking an elderly man in his vehicle and abusing an older wheelchair-bound woman, among many other similar acts. Meanwhile, police stood by and took no action as they watched innocent people being abused. This association or cooperation seems to run even to the highest levels within the Democratic Party, with the son of Virginia Sen. Tim Kaine being widely reported to be affiliated with Antifa, following his arrest after a protest involving the group. Kaine was the Democratic vice-presidential running mate of presidential candidate Hillary Clinton. Leftist philosophy brought us Hitler, Stalin, Pol Pot, Chairman Mao, and Saddam Hussein, to name a few, and continues to inflict most of the violence on the world that has killed many millions. 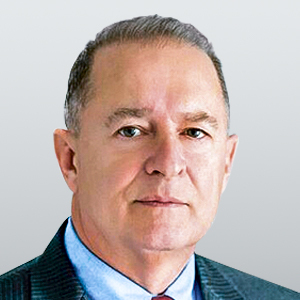 Brad Johnson is a retired CIA senior operations officer and a former chief of station. He is president of Americans for Intelligence Reform.